Home / / Choosing the best paint for the job! If you are planning a home painting project, it’s important to choose the right paint, so that you get the best possible results. There are many different types of paint available, so you might need a few pointers to help you make the best selection. If you are painting an interior room, you need to choose the appropriate paint finish for the job. Interior wall paint comes in a flat finish (sometimes referred to as “matte” finish), eggshell, satin, gloss and semi-gloss. A flat paint finish is often the preferred choice for the most professional appearance. It doesn’t reflect light as easily as the other finishes, so your walls will look more perfect, and small imperfections will not be as visible. However, flat wall paint isn’t nearly as easy to keep clean. If you have small children in the home, you might be constantly trying to clean little fingerprints off of flat finished walls. Ceiling paints are usually a flat finish, which helps to hide ceiling imperfections. An eggshell finish has just a hint of sheen, and is just slightly more glossy than flat. Although eggshell is still not easy to clean, it holds up better than flat does. Satin is a very popular choice, because it is often considered to be the perfect balance of attractiveness and ease of cleaning, especially when it is used for high traffic areas and trim. It works well in the bathroom or kitchen, because it is much easier to clean, and can even survive some light scrubbing. It’s also a great choice for kids’ rooms. Semi-gloss finish paint is usually considered too glossy for use on walls, but it can be a great choice for doors and cabinets, and for trim in very high traffic areas or places that you will be cleaning frequently, like the wood trim in the kitchen. Gloss finishes are definitely not recommended as a wall finish, but can be a good choice for furniture, and possibly on some cabinets and trim. It will show every single flaw on the surface you paint, so if you use gloss paint, be sure to prepare the surface very carefully. If you are planning an exterior painting project, you will need to choose between latex and alkyd paint, often referred to as “oil-based” paint. Alkyd exterior paints can have excellent adhesion, but they also tend to chalk, and can get brittle and crack over time. If you’ve previously painted your home with alkyd paint, you probably will choose to repaint it with alkyd as well. However, you should never apply alkyd paint to fresh masonry, or galvanized iron. Latex exterior paint has much better elasticity over time than alkyd paint. It is easy to clean up, and is quite durable. It doesn’t chalk as easily as alkyd paint, is more resistant to mildew, and it can have excellent adhesion. 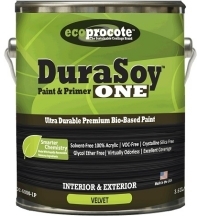 Latex paint also dries much faster than alkyd paint, and is a more environmentally-friendly paint choice. Whichever paint you choose, remember that your paint job is only as good as the weakest layer. Always prepare the surface properly, using a good primer if necessary.